For what seems like forever now we've been hearing from every automotive journalist you can think of that the Porsche 996 Turbo is the next collectible Porsche and to "buy one now before it's too late". The trouble with everyone shouting things like that from the rooftops is that sellers will eventually hear you. At least that seems to be the case with this example. 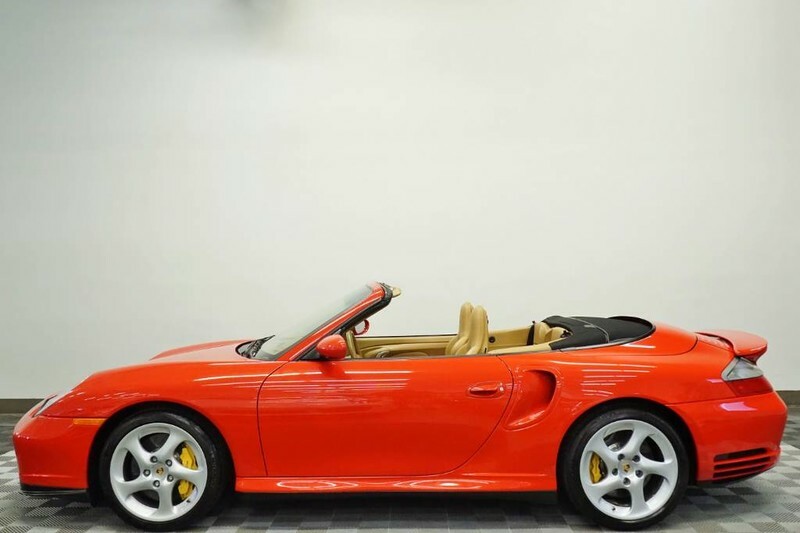 Arguably a very collectible example, this 2004 996 Turbo Cab comes in a striking combination of Guards Red over Savanna Beige leather. Nicely optioned from the word go, with only 11,500 miles on the clock, sports Ceramic brakes, electric sports seats, the X71, X70 an X54 packages and a host of other options that total nearly $18k above and beyond the original MSRP of 128,200. I'm not quite sure pricing is this high, yet for 996 Turbos. If it were, this might just be the one to command it. We've been thinking of selling our Forrest Green 993 C4S for a while now (not getting much past the thinking about it part) so we're always watching the listings to see what pricing and bid activity looks like. eBay isn't always the best yardstick for measuring pricing, but it does a good job of showing activity and seller expectations. For a while it seemed like the 993 market had dropped some. Recently it appears as if seller expectations are on the rise. This '96 C4S is a great example. Completely stock, like ours, with similar mileage but way fewer options, this 993 has an asking price of $96,900. Will the seller get their price? That remains to be seen. However, so far there are at least 13 others watching the auctions so it's safe to say there is interest. As we continue to look for a new to us daily driver, one contender is a newer C4S. This one stood out due to the color combination (Agate Grey over Yachting Blue with a blue top), option list, mileage, warranty and the yards and yards of leather options its configured with, not to mention the Burmester Audio Package. 4-years ago this car stickered at $151,295. You can have it for half of that! This listing reminds me of Jalopnik's old "nice price or crack price" column. I can't decide which it is. On one hand this 912 is said to be completely original and a very rare color. On the other hand it looks to be in need of significant cosmetic restoration and will most likely need significant engine work based on how long it's been sitting. 912s have definitely been gathering steam in the pricing department, I just can't decide if they've gathered this much. What do you think? If we had the storage space and the budget, this 914 would already be in our garage, just for the color combination alone. Adriatic Blue over Black Leatherette with Blue Tartan inserts. Just give me the keys already. Did we mention it's a matching numbers 914-6 with a Concours pedigree longer than its wheel base. The listing does a nice job of detailing its provenance at a high level and the pictures provide a remarkable presentation. Mileage is assumed to be since the most recent engine rebuild in 2004, but do your due diligence to be sure.